The Great SX Pro Giveaway! 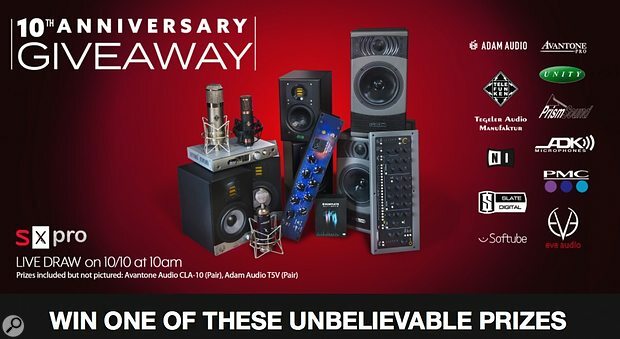 UK retailer SX Pro are celebrating their 10 year anniversary by giving away over £10,000 of their all-time favourite gear to say thank you to their many loyal customers. You just need to sign up via the web form at www.sxpro.co.uk/giveaway to be in the draw for prizes from PMC, Prism Sound, Tegeler Audio Manufaktur and many more. The full prize list consists of PMC Result6 (Pair), Unity Audio Mini Rock (Pair), Eve Audio SC205 (Pair), ADAM Audio T5V (Pair), Avantone CLA10 (Pair), Prism Sound Lyra 1, Tegeler Audio Manufaktur Crème, Telefunken Elektroakustik CU-29 "Copperhead" Microphone, Slate Digital ML-1 Vintage Edition Microphone, ADK Zeus Microphone, Native Instruments Komplete 11 Ultimate, Softube Console One. SX Pro's international customers are eligible too, with the draw taking place at 10am on the 10th of October 2018.